The haze of political chaos in America surrounding the Ferguson protests, the Torture Report, and the “relaxing” of US-Cuba relations has been broken by a media spectacle almost too ridiculous to comprehend. A hacker group called the “Guardians of Peace” conducted a “cyber attack” on Sony Pictures Entertainment, leaking emails, documents, presentations, and information about the company. The US government, and the vast majority of media, all agree that the Democratic People’s Republic of Korea (DPRK) is behind the attack, as a direct retaliation to the production of the movie The Interview, a goofball comedy depicting Seth Rogen and James Franco attempting to assassinate Kim Jong Un. And given the general media narrative about the easily offended egos of the Kim family, such a story is perhaps not unbelievable to mainstream audiences. However, the evidence seems to be flimsy at best — as a Wired article points out. Yet the media circus continues. The narrative is just too powerful: a ruthless, eccentric, and egomaniacal dictator out to silence any criticism of his good name, regardless of how silly and “innocent” that criticism is. This looks less like an innocent, if offensive, stoner comedy, and more like a propaganda movie. Its purpose is to legitimize and normalize the idea of the illegal assassination of the leader of a sovereign state — it’s no surprise South Korean activist groups wanted to drop copies of it in North Korea with balloons. Imagine if Putin’s buddies at the Kremlin sat down with the Russian film company Mosfilm to discuss the crucial plot details of a movie depicting staggering human rights abuses in America and the brutal killing of Obama to stop US imperialism. Imagine, too, that the stated purpose of the movie should be to inspire such an action in the real world. We would be absolutely shocked! US involvement with Hollywood is an old story — as early as 1991, Michael Parenti’s book Make-believe Media detailed the Pentagon’s involvement in producing a positive image of US military practices. It’s not something we’d like to think about, because to think of the (often not-so-well) hidden agendas of the entertainment we consume might compromise our enjoyment of it. But history shows us that the effects of “innocent” entertainment can be deadly. The racist depictions of Japanese people during WWII undoubtedly made it easier for FDR to send up to 120,000 Japanese-Americans to internment camps. Even today, some Americans defend the atrocious nuclear bombings of Hiroshima and Nagasaki through that (albeit now toned-down) racist lens. US media and entertainment depictions of Saddam Hussein normalized and legitimized the brutal invasions and genocidal sanctions that were inflicted upon Iraqi civilians. We are sometimes misled to believe that the media and entertainment depictions of North Korea are somehow about its human rights abuses. And to be sure, according to most international conceptions of liberal democratic human rights, North Korea doesn’t exactly have a very impressive scorecard. But more often than not, what media and entertainment provide is not a serious discussion on the human rights situation in the DPRK and the possible ways of solving it. No one can be foolish enough to assume that The Interview, for example, will attempt anything remotely like that. The DPRK’s status as a dictatorship that violates human rights is but a footnote in the media image surrounding the country. The DPRK we are exposed to through the media is an orientalist spectacle, in which its human rights record merely serves as a backdrop to a racist, dehumanizing ideological narrative. There are many dictatorships and gross violations of human rights in countries all over the world — to many of which the US leaders are giving plentiful aid and support. But North Korea is given a special status among these dictatorships. Unlike US-friendly dictatorships, the DPRK represents an “Other,” whose crime is a combination of its indigenous culture and anti-imperialist, socialist political ideology. The media portrayal of North Korea racializes it as “Oriental” or even “Confucian.” It is almost as if Edward Said’s work had been read as an instruction manual instead of a criticism. It’s not, strictly speaking, the “Kim Dynasty” that is the problem for imperialist propagandists — it’s North Korea’s civilian population. The “brainwashed” Asians with an “unquestioning” respect for authority are the real issue at stake. 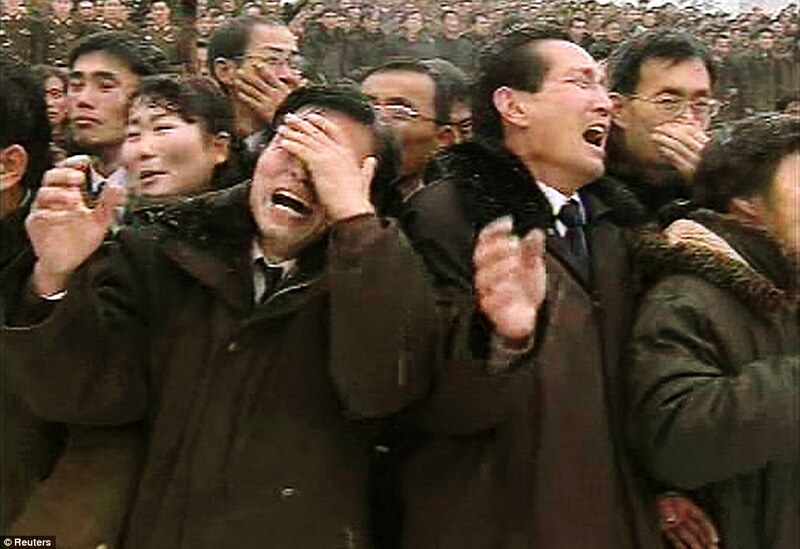 Thus, the images of North Korean citizens weeping over their deceased leader Kim Jong Il are weaponized against them. This deliberate targeting of the civilian population’s complicity in the DPRK’s rule serves to dehumanize them — it’s easier to kill, subjugate, and exploit a population that you believe to be unreasonable, child-like cult members with an inability to accept the self-evident truths of human rights through imperial dominance. Perhaps that is why the revelation that the US had considered using nuclear weapons against North Korea in 2013 didn’t receive the widespread attentions of millions, but a flimsy allegation of hacking a corporation does. The entertainment media does its share to promote these notions — Matt Stone and Trey Parker’s Team America: World Police, with its unapologetic racism, is a prime example. One can only guess the level of racial and cultural sensitivity to which comedians like Seth Rogen would adhere in The Interview. The news media, for their part, abandon all journalistic integrity when reporting on the DPRK. On a regular basis, respected and widely read publications publish baseless, sensationalist, and racist stories about the country. Many of these stories are easily sourced to satirical sites — others to right-wing Fox News-esque South Korean newspapers. Stories that hundreds of thousands of people read include Kim Jong-Un feeding his uncle to 120 starving dogs, forcing all North Korean men to get his haircut, and sending the DPRK soccer team to work in the coal mines after failing in the World Cup — stories which were all fake. The things we are ready to believe about North Korea prove more about the brainwashing of us than of the North Koreans themselves. These stories are often corrected by the media sources themselves after they have already been published, but they are rarely as much of a fun read as the original stories. In the “free market of ideas,” baseless and racist propaganda yields a higher rate of profit than principled journalistic inquiry. Let me be clear: The Interview looks like a horribly bad movie that is very unlikely to inspire the overthrow of any government anytime soon. With a cast-list featuring Guy Fieri and Eminem, and an end product that seems to be universally despised by the Sony execs themselves, the hacking was hardly the only thing working against it. But the massive spectacle that has arisen around this movie serves a purpose — the US government will use North Korea’s alleged involvement in censoring “criticism of the regime” to rationalize continued US militarization of the South Korean borders, authorize illegal attempts at subversion, and rally support for sanctions that will keep the civilians of the DPRK poor, hungry, and isolated. Jakob Pettersson is a Swedish activist affiliated with RKU (Revolutionary Communist Youth). He has contributed articles to Swedish India-solidarity organization Indiensolidaritet‘s monthly magazine. Read his blog Interrogation of the Good at <interrogationofthegood.blogspot.com>. Follow him on Twitter @YakovPettersson.